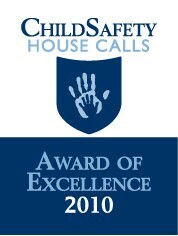 On behalf of the emergency pediatricians and staff here at Child Safety House Calls we are delighted to inform you that you have been awarded our 2010 child safety product Award of Excellence. We evaluate hundreds of safety products each year in our own homes and we were very impressed with the innovation of your product and its ease of use especially given the significance of the safety hazard it addresses. Dr. Schmidt and I see many children each week with head and face injuries related to hearths and we hope that this endorsement will help to spread the word about your product.